What Size Wood Burning Stove Do I Need? Calculate the cubic space of the room by multiplying the width, height and length. As a rule of thumb, divide the cubic space by 14 and this will give you a KW output needed for the room. If your room needs a wood burner between 4-6 KW then you need a small wood burning stove. If your room needs a wood burner between 7-9 KW then you need a small wood burning stove. If your room needs a wood burner between 10-15 KW then you need a small wood burning stove. Using our calculator, you can take into account how well insulated your house is. Using our calculator you can also take into account if you like the room to be warmer than 20°C or not. 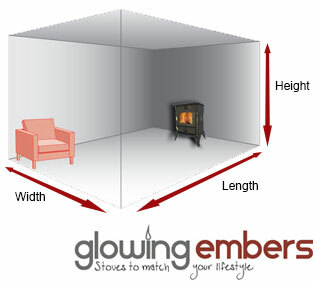 When choosing a wood burning stove it is difficult to know what size stove to buy to suit your home. First thing to note is that people often buy a stove that is really too big for their needs, whilst it is tempting to just buy the largest stove possible this isn’t necessarily the best option. First, any stove that you get which is over 5kw needs an air brick or ventillation kit installed in the room that stove is in to ensure adequate air flow but it is recomended for any burning appliance of any size. Second, all stoves have an optimal performance efficiency and to acheive this they need to be running at their nominal heat output, if they are running at less or more than this they become less efficient, meaning that you spend more on fuel and the exhaust is more damaging to the environment. Accordingly getting a stove with a nominal heat output that matches your room is desirable. To get a better idea of what heat output you will need from a wood burning stove you can use our heat output calculator. You should remember that this is only a guide as factors such as how well insulated your room is etc will affect the output that is needed. Another important factor to consider is the physical size of the stove, you need to physically have enough room for the stove, allowing 150mm of clearance to the sides and rear and 225mm to the front of your hearth to comply with the building regulations. Your stove should also be 950mm away from any combustable materials, so you should always check the dimensions of the stove and measure up before buying. 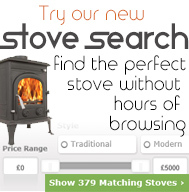 Once you have spent some time to consider what size of stove to buy you can then look through our range of wood burning stoves that will best suit you. We have a complete range of small 4-6kw wood burning stoves, medium 7-9kw wood burning stoves and large wood burning stoves from 10-15kw. According to your instructions ALL rooms of whatever size need a small woodburning stove.